After 3 days of driving, it was time for a day off. And, what a better place to do so, at friend’s Tom’s home and workshop in Louisville, KY. Paddy has known Tom back in his Michigan days, and I was about to meet Tom for the first time. Tom is an artist. A sculpture artist. Not just a sculpture artist either. More like magician. He loves to work with balance, and his kinetic works hinge on finding that balance point, and then playing with it by moving the balance point to the “edge”. Pretty much describes life…right? You become mesmerized, and suddenly find yourself adjusting various elements of the sculpture to see “just” where it comes out of balance….and then restoring the balance before anybody notices what a mess you’ve made. Actually, the tricky part of the “balance act” was walking thru Tom’s hallway, filled with perfectly balanced kinetic sculptures – and trying not to run into them with our luggage and my hula hoop. I wasn’t entirely successful, but at least the metal “teeter totter” with carefully placed balance balls didn’t get too unruly. Tom is a delightful human – simple, funny, compassionate toward others, and passionate about his art. What is his…is yours. 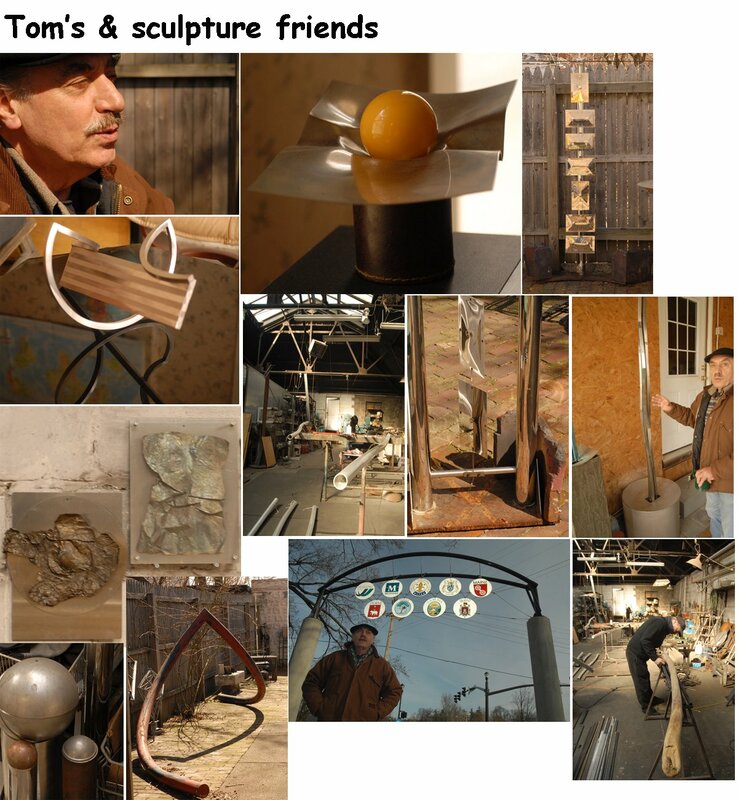 Any time I commented how much I liked one of his sculptures….he sincerely wanted me to have it. You know, just take it home with me. Sigh. I had to stop drooling out loud, and just enjoy the moment. Paddy and Tom spent the day taking pictures, eating wonderful vegetarian foods, drinking lots of coffee and catching up on “old times”. 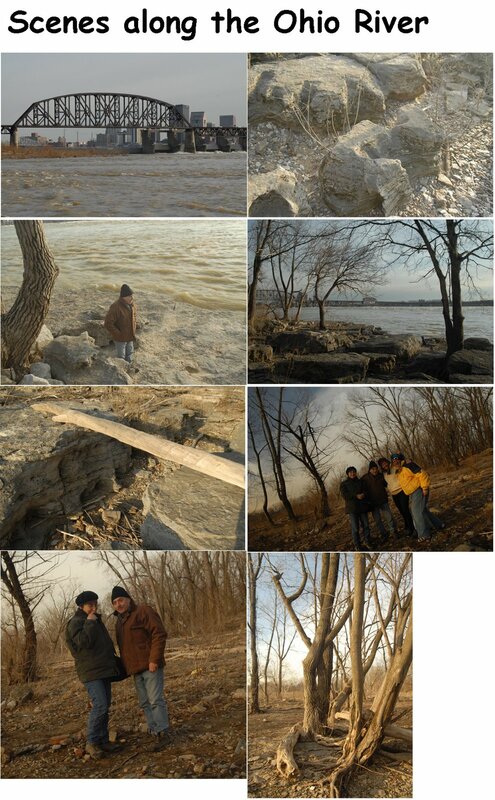 Later in the day we were joined by Tom’s g’friend Jennifer…and all went fossil hunting along the river bed of the Ohio. Back in the 1980’s, and shortly after Tom’s stint at teaching sculpture @ Grand Valley State College in Michigan…he decided he needed a life change. No more welding…no more sculpture…and no more teaching. So he drove his truck to Arizona…in the desert – and took up residence (aka – out of his truck). He got a job as a gardener (along with a bunch of immigrants from Mexico), and despite getting scratched up pretty bad by the cactus….enjoyed the change from sculpture and teaching. Within a week, the foreman noticed a fence that was badly damaged….and needed to be welded to get fixed. After thinking it over for some time, Tom admitted that he knew how to weld….and quickly fixed the fence. The foreman was thrilled, and told him “You are no longer the gardener, you’re the welder”. And from that point on, Tom was the welder. Of course his fellow-gardeners, noticed that welding was a “step up” from gardening….and they all wanted to learn how to weld. So, one by one, the gardeners became Tom’s apprentices in the welding shop…and eventually Tom was back to welding and teaching. Moral: You can’t escape You.